The 10 Best Spots for Paint & Wine in Florida! Paint and sip classes have taken the country by storm, providing their aspiring artists with expert instruction and all the supplies they’ll need to create their very own masterpiece. Pack your coolers with your favorite wine to get your creative juices flowing and prepare to be inspired! Our favorite paint and wine studios across sunny Florida are perfect for a fun night out. After a fun day at the shore nearby, head to Vino Van Gogh in Delray Beach for a fun way to wind down and escape the sun. Take one of their traditional art classes or order a special, custom paint by number kit to relive your favorite memory for a personalized experience. With locations stretching from Jacksonville up North to Fort Lauderdale in the south, it’s likely this fun studio has a spot near you! Whether you’re an experienced illustrator or an artist-in-training, Pinot’s Palette has a picture-perfect class for anyone. Offering adult and children’s classes, this Vero Beach imaginative workspace is great to bring the whole family. The experts here make “doodlers into Da Vinci’s” with their innovative classes. All levels of artists are welcome to attend! Even if you “can’t draw a stick figure,” the local art specialists at Vino’s Picasso in Fort Myers and Naples are here to help. Featuring a wine and beer bar with local gifts, you don’t even have to worry about bringing some liquid inspiration! As the great Ralph Waldo Emerson once said, “Every artist was first an amateur.” In the bustling city of Miami there are an abundance of activities to do but if you’re looking to try something new, Bottle & Bottega is a spot you’ve got to check out. Their artistically stimulating studio will inspire you to create your best work. With three studios in North and Central Florida, Yes You Canvas’ has both adult and all-age classes for everyone! Whether you’re looking for a spot for your child’s birthday party or want to have an adults-only night out, this studio has so much to offer! Bring your own booze and get ready to get artsy! Art Party in Fort Lauderdale is a fantastic place for beginners to get their start in the world of painting; no experience required. While some of their paintings look advanced, don’t worry! Their step-by-step instructions will surprise you with how easy they are to follow. Looking for a fun place to attend a singles night, team building activity or bachelorette party? Check out the Winey Wench’s several Sunshine State locations. After class browse through their gifts and huge selections of unique wines! Art Cellar’s easy to understand instructors and wide variety of painting options will have you coming back every time you want to have an artsy night out! With plenty of whites, reds and beers to choose from, you’ll wind down and be in the perfect mood to create some unforgettable memories. In the adorable and unique Winter Haven area you’ll find one of our favorite paint and sip studios, Paint Along! 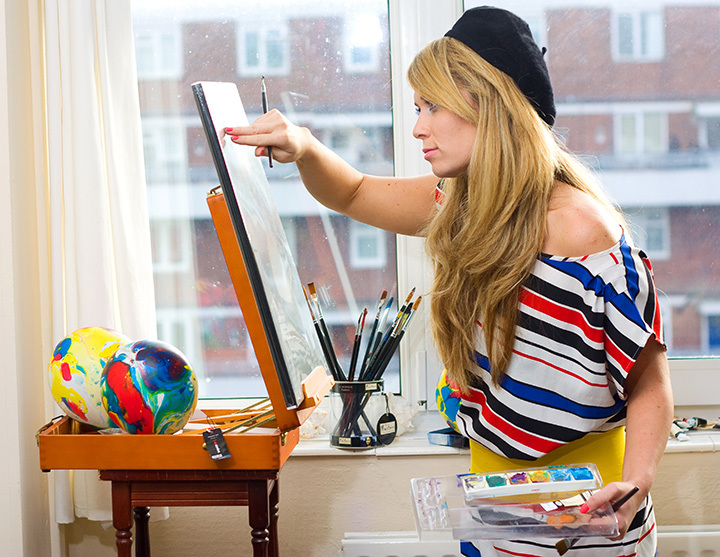 Even if you’ve never picked up a paintbrush, their master artists will have you feeling like a professional. Come in on the weekend for a fun activity!